It’s Earth Day—What are you doing? Continuing with Cast Ons--The Eyelet Loop. Will I have enough yarn to make it to the third and final button hole? I think so--Just 2 more rows till the button hole. And maybe 2 more rows after that—That would be ideal Then I can switch to the solid “Royal Purple” colorway of the Patons Classic Merino—the same solid I used to cast on. Thing is, the rows are so long now! While Sally Melville did a lot to make me appreciative of garter stitch, I am so bored with it! I can’t wait to get to the lace with it’s yarn overs, and knit 2 togethers, and glorious rows of purls. Unlike Ms Zimmerman, I like to purl (I don’t LOVE to purl—thought I have occationaly worked garter stitch in all purls) but do love the change—rows of plain knit and plain purl get boring too—and huge swaths of stocking knit aren’t much fun—but they are still better than endless garter! I’ll update with a photo when I get to the color change--maybe tomorrow --or maybe Wednesday--I hope the former.. but suspect it won't be till the latter. My subway knitting—always a small, light, simple project is--yet another-- pair of socks. The yarn is (once again!) Patons Kroy –Jacquard this time. The color way, Tutti Fruitti. I almost didn’t buy it—I wasn’t sure if I liked it. But it was half price in clearance bin…well--I had to—who can resist the opportunity to get socks for under $5? I decided immediately, I would tone it down with a solid—I’d pick up a solid color to add to the cuff, the heel and the toe. almost the same colorway! And immediately recognized it. It was from a few years ago—Lion Brands Magic Stripes in color way called spring stripes or something similar. The Lion Brand colors were less intense, Pink not a Hot cherry pink, and the black wasn’t so much black as dark grey. Sure enough when I checked the drawer, there were a pair of socks with the almost the same colors/same stripes. 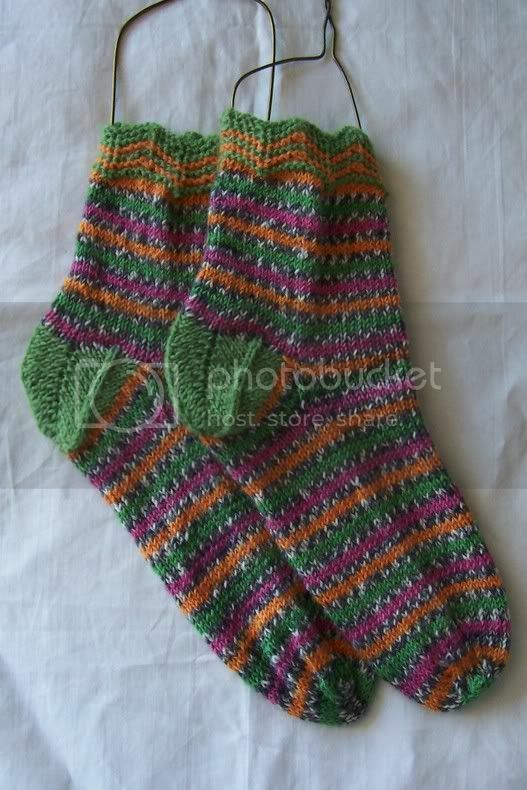 (here they are in my Photobucket album—these socks are pre-Ravelry)—trimmed with the solid green and orange. Hmm. I needed to do some thinking!—I wanted a very different pair of socks. So this pair has a bit of black lace before the ribbing, and will have some black trim in the heel flaps, and black again in the toe—and will be different enough! Next time I photograph them, I'll do something to open the lace up, so you can see the detail. *I don’t have plans for an special project for my many mini balls—but I use them all the time to trim socks..
One of “unsuccess” attempts at creating an orange yarn(for the Ring of fire socks)—was just perfect for Mast socks. And it’s likely a pair of socks—worked for the most part in solid orange, (or maybe navy) will be trimmed with some intarsia leaves—made from the left over brown striped yarn of the Mast socks. Orange is just perfect for making a border of pumpkins --just the thing for trimming a solid black sock! My bag of left over bits is a endless source of inspiration! These are adorable and I love the lace trim.